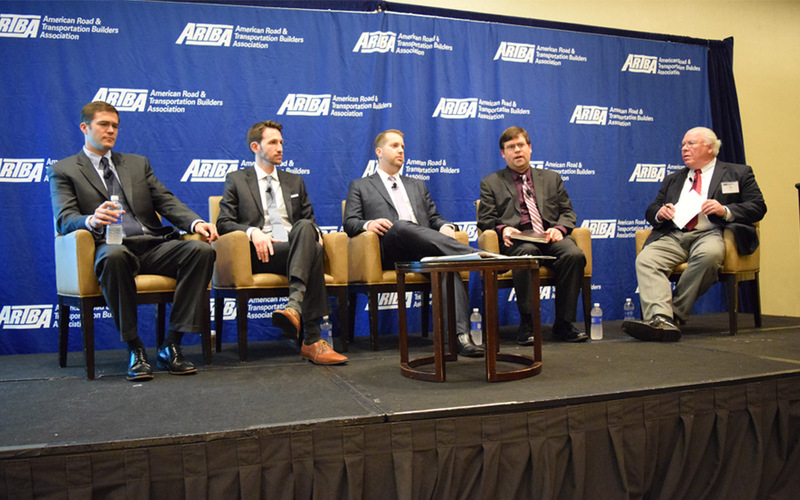 Senior staff for the House Ways & Means and Senate Finance Committees told delegates at the 2015 ARTBA Federal Issues Program they are working to find additional revenues for the Highway Trust Fund (HTF) as part of a re-write of the corporate tax code. ARTBA Executive Vice President Bill Toohey, who moderated the session, pointed out that most of the one-time infusions of revenue being discussed as part of any tax reform effort would place the Highway Trust Fund in the same or worse situation than it is today once that money runs out. The staff agreed that would be the result, but said many members of the House and Senate prefer stop gap measures over increasing user fees. Toohey pointed out that Congress passed the 32nd short term extension of the programs and fifth temporary trust fund patch last July amidst claims that additional time would allow them to find a path forward on a revenue plan. In response to Toohey’s question about what progress has been made in those eight months, a Republican Senate Finance Committee staff person noted the panel has created a series of working groups—including one on infrastructure—to develop a bipartisan recommendations for inclusion in the Committee’s tax reform deliberations, but suggested another temporary extension was likely. House Democratic leadership staff, however, countered that nothing has been done and pointed out Congress hasn’t even had a hearing on the trust fund in those eight months. The uncertainty about potential solutions and lack of progress reflected in this discussion underscore the need for all ARTBA members to aggressively push their representatives and senators to develop a long-term HTF plan and communicate that more temporary extensions and trust fund patches are not a solution.